“We make it e﻿asie﻿r f﻿or you to get the job done! What is a roll-off? A roll-off is a dumpster with a door that opens. 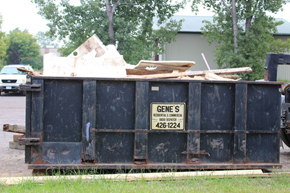 The door allows one to carry, roll, or drag the debris into the dumpster rather than lift it over the sides. 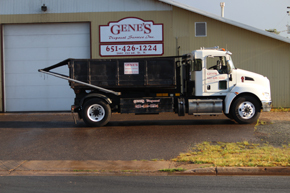 Gene’s Disposal Service has a variety of roll-off sizes to assist with your clean-up, construction, demolition, and recycling needs. Pricing depends on the type of materials put into the roll-off. Please CALL US to schedule a roll-off. 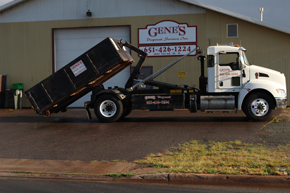 Our roll-off dumpsters can be used for just about any purpose including a variety of clean out and clean-up jobs. Our service area for roll-offs includes the following cities. Please CALL US to confirm location as service areas within each city vary.